At some point, a bear market will occur for every asset class. Right now, the cryptocurrency bear market has many people in the blockchain space worried about the long-term prospects of the entire blockchain industry. In a bear market prices are depressed, trading volume decreases, and stop-losses are triggered, leading to a downwards spiral of prices and emotional sentiment. However, where many only see doom, a bear market is also ripe with opportunity. 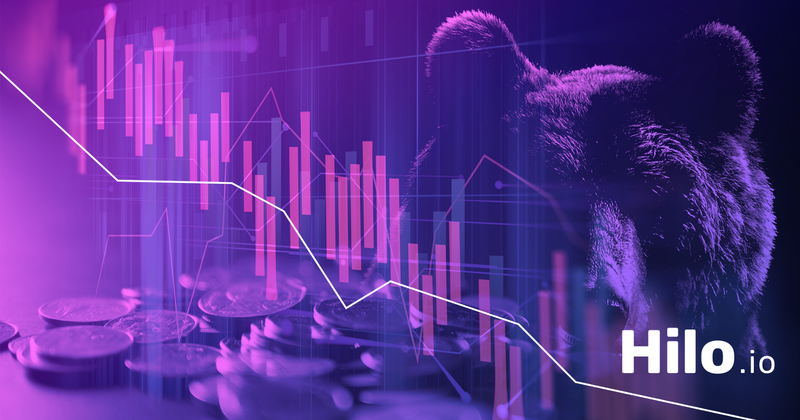 In this article, we explore the myriad of opportunities that are often overlooked in bear markets. Not all cryptocurrencies depreciate at the same rate in a bear market. For instance, in the last few months Ethereum was around ½ to ⅓ its price during the 2017 bullrun. However many smaller altcoins are now ⅕ to ⅛ their All Time High (ATH) from the bull market. Many of these depreciated coins are reputable projects as well. This gives Ethereum and Bitcoin increased buying power in a down market. One can take advantage of this to diversify their portfolio and acquire more units of reputable alts. The downside of this strategy is that you’re letting go of some BTC and ETH at prices that are far from ideal. But it’s common to hedge bets in all forms of trading. One may strongly consider investing in newer coins and tokens with BTC or ETH pairs during this period. This is advisable when ETH and BTC have not depreciated as sharply as other assets. The act of scalping is to take many small trades on micro-price movements that occur frequently within cryptocurrency charts. It’s often a grind, and not always profitable. One must make enough small-margin trades that can eventually add up to fairly decent profits. There are two approaches to scalping. Some people do it to increase units of a specific coin. For instance, you can buy sell some of your holdings of a particular coin when you think the price is going to drop. When prices actually drop you can buy in at a lower price to increase your position. Another strategy is the more traditional buy-low-sell-high but at a more frequent intervals. This relies on hour-to-hour volatility. Some people rely on software (bot trading) since it allows higher frequency trading to occur, but the risks of loss are always present. It’s easy to erase profits through a single trade that goes awry. Trading isn’t always the best strategy, sometimes it’s best to buy and hodl. Trading is fast paced and requires an immense amount of research to ensure you have relevant information. While hodling, it’s a great time to research new prospects as well as to brush up on your overall blockchain understanding. Crypto may be a longer game than some may want, but investing is a long game play. Like all important technologies, blockchain may require an intermediary period where projects have to gain traction and find market fit. No matter what state the market is in, it’s important to be well researched and have a clear understanding of exactly what you’re investing in. To run a masternode you’re essentially storing a full copy of a particular blockchain. To disincentivize bad actors most currencies require you to collateralize enough units of the underlying currency for the node. For instance in order to run a masternode of DASH you need 2,000 units of DASH in the wallet. Additionally, you’d need storage space to save the DASH blockchain and 24/7 internet access to capture updates in the blockchain. The reward for operating a masternode is intermittent cryptocurrency payments that are almost like interest. The downside of masternodes is the high overhead. While you may be earning coins passively, the bear market can also cause your coins to depreciate. In other words, the coin-holdings necessary to run the masternode. If you have the capital, it’s advisable to only set up masternodes for coins that you are long on. Many people associate PoS (Proof of Stake) as an extension of masternodes. In reality, not all coins that allow masternodes are PoS. Functionally, PoS coins operate similarly to masternodes in that you can hold a certain amount of currency in a staking wallet to receive proportionate rewards. Usually there are no minimums for PoS currencies, additionally there are different types of PoS payouts. Staking some currencies like OKCash will pay more units of the same currency. In other cases some currencies pay a different currency like in the case of NEO. Staking NEO will yield GAS. In either case staking is a great alternative to holding coins in an exchange wallet. While the gains from staking might be marginal, at least they’re consistent. The same is not necessarily true for speculation. Airdrops are common marketing campaigns operated by cryptocurrency projects. There are different terms one may sometimes have to meet in order to be eligible for a particular airdrop. For instance, some airdrops are percentage based. Meaning you’d earn a quantity of coins relative to your existing holdings. Other airdrops request tasks from recipients. For instance, some may ask you to follow the social media accounts for the project. It’s important to be careful since many people cloak scams in the forms of airdrops. Never send coins or private keys to an airdrop. In no case would it be necessary to provide these to claim an airdrop. There are many resources ranging from Telegram Groups, to websites specifically dedicated to finding different airdrops. In any case, make sure you’re fully clear of the stipulations and terms behind an airdrop before proceeding. In any case it’s always good to keep an eye out for airdrops in a bear market. The micro-cap coins that you’re collecting today could be worth a lot in the long term. The more airdrops you try the more chances you have of earning significant returns. All of these strategies are futile without research and that’s why we’re building Hilo.io. Hilo.io is a social platform for crypto traders. Hilo.io’s platform acts as a dashboard allowing for users to interact with friends, manage your portfolio, discover new coins, and catch up on all things crypto. Our token will be utilized to incentivize users, transact, and encourage widespread token adoption to the average person. Hilo.io is your connection to crypto. For more information about Hilo.io, visit https://www.hilo.io/.